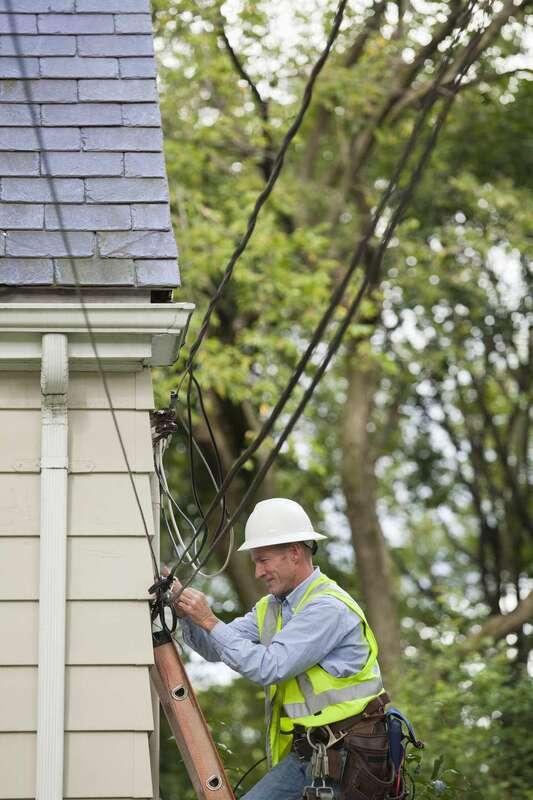 An electric service drop is the main electrical line that runs from the electric company's man overhead transmission lines to the service head at your house. Because the power company lines are higher than your home, the feeder line that goes to your home literally drops: the line descends from a higher spot to a lower spot. Service drops are sometimes called overhead wires or overhead service. All electricity to your home comes through the service drop. If the service drop goes down, all power in your home will shut off. Catastrophic events such as downed trees and large severed limbs can take down a service drop. Yet service drops tend to be stronger than one might expect since they are not self-supporting but are held up by a steel cable. Fallen service drops are extremely dangerous, since they carry enough electricity to power an entire house. Do not approach a fallen service drop. Temporary service drops can be run to a free-standing pole, a separate building, or even a tree, in some cases. The service head, also known as a weatherhead or weather cap, is the part that is attached to the house. Because the J-shaped top faces downward, rain cannot enter the conduit that leads down to your service panel. The service head also acts as a stable, secure point (or mast) to tether the electric service line. In many areas, this tether point must be able to hold at least 200 pounds. Working downward from the service head and mast is the electrical service panel, usually located inside the house. The circuit breakers are located in the service panel. The service panel is not considered to be part of the service drop. Near the service head is a looped section of the power line. Though it may appear that it is there because extra wire had to be taken up, it is an intentional feature called a drip loop. Water coursing down the service drop line ordinarily would continue down into the service panel, resulting in severe damage. Instead, water traveling down the line will be stopped from entering the house by the drip loop. Drip loops are a common feature whenever electricity and water are within close proximity of each other. Height requirements are different according to local building and electrical codes. In many cases, the drop height above sidewalks must be at least 12 feet high. Above residential driveways, the height is increased to 12 1/2 feet to clear large obstructions like recreational vehicles. Above public roads, the service drops should be at least 18 feet above the road. In general, drop heights are lower over residential areas due to the shorter objects and equipment typically found there. Large equipment such as cherry picker bucket trucks that might interfere with service drops is not usually found on the residential property itself. That is why the height requirement is increased to 18 feet over public roads. While homeowners in many municipalities are allowed to do their own electrical work, such work is limited to activities such as replacing outlets and lights, running electrical cable and even running new circuits if the homeowner feels comfortable doing so. But comfortable or not, working on anything upstream of the service panel should not be attempted by anyone who is not a licensed electrician or an electric company worker. Though it is not common, service drops can become severed from the weatherhead in the event of high winds. While electrical service contracts vary from place to place, typically the power company will re-attach the service drop to the home. Most municipal power companies will not fix the weatherhead, mast, or electric service panel. Why Use Electrical Drip Loops?